Hunters Kill 185-Year-Old Alligator in Mississippi-Fiction! - Truth or Fiction? Hunters Kill 185-Year-Old Alligator in Mississippi-Fiction! Hunters Kill 185-Year-Old Alligator in Mississippi – Fiction! A group of hunters in Mississippi shot and killed a 185-year-old alligator that was used for target practice by Confederate soldiers during the Civil War. The claim that a 185-year-old alligator was shot and killed in Mississippi is a hoax. “Nine of the wounds on the animal are believed to have been caused by Enfield Pattern 1853 rifle-muskets. These old injuries were concentrated around the animals tail and hind legs, suggesting that the reptile could have possibly been used as a target for shooting practise by Confederate troops. And a photo that appeared with the story that shows four men standing behind a slain alligator was actually taken in Mississippi, but it doesn’t show a 185-year-old alligator. The alligator shown in the photo weighed in at 792 pounds, which set a Mississippi state record in 2014, NBC News reports. OMG! 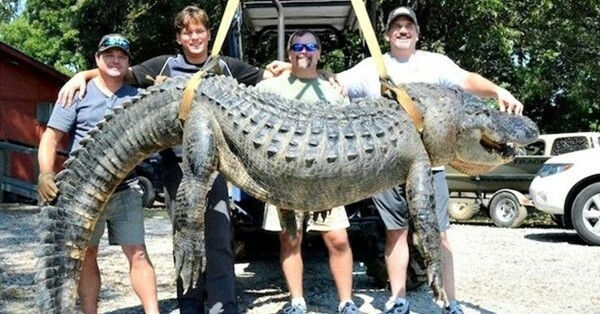 They killed a 185-year old gator! Ghost Ship Full of Ebola Rats Headed Toward U.S. – Fiction! ISIS Fighter Converts to Christianity After Allah Rejected Him-Fiction!